I am Mitchell den Duijn. I'm 17 years old and I am from Alphen aan den Rijn, the Netherlands. 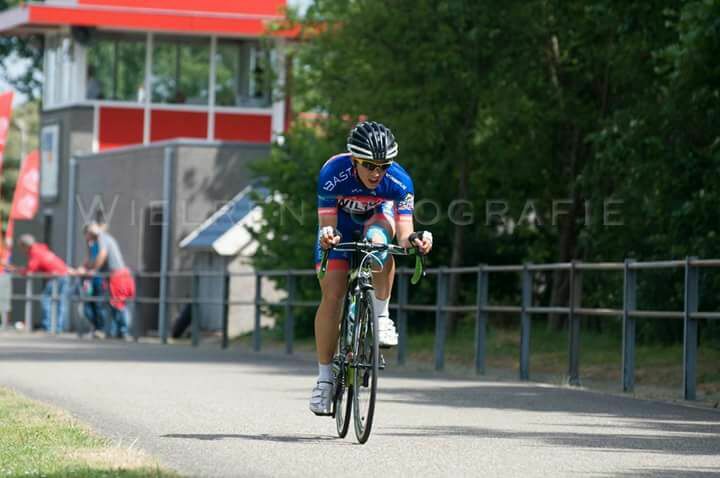 I ride for UWTC De Volharding (Wilton Cyclingteam). I started cycling when I was 9 years old. I started because my parents always watched the Tour de France on television and I really liked that, so I asked my parents if it was okay if I started cycling. Furthermore, my uncle cycled when he was younger and I always liked to listen to his stories about cycling. I played football when I was younger. I prefer cycling on the road, especially the classics. I also train on the track in the winter and participate in a couple of track races for fun. In 2016, I was 15th at the Dutch Championships and 5th in a Dutch Classic. In 2017 my best UCI 1.1 results where 28th at the Ronde van Gelderland and 59th Omloop der Vlaamse Gewesten. I was also 8th at the District Championships. I hope that I can keep developing for even better results. My first UCI 1.1 classic, this was a special moment for me. Guido Reybrouck classic, I like this one day race because there are a lot of cobbles in it. I don't have a favourite. Most of the time I listen to Dutch/English rap and the Top-40. In my spare time I like to watch Netflix and play video-games. I hope to have a great season in my 2nd year as junior and then make the step to a good U23 team.